The Pakistan Space and Upper Atmosphere Research Commission (Suparco) will celebrate the World Space Week (WSW) 2012 in 10 major cities from October 4-10. These cities include Islamabad, Karachi, Quetta, Faisalabad, Peshawar,Gilgit, Hyderabad, Bhawalpur, Lahore and Abbottabad. The World Space Week is an international celebration of science and technology, and their contribution to the betterment of the human condition. The United Nations General Assembly declared in 1999 that the World Space Week will be held each year from October 4-10. These dates commemorate two events i.e., October 4, 1957 reminds launch of the first human-made earth satellite, Sputnik 1, thus opening the way for space exploration while October 10, 1967 reminds the signing of the Treaty on Principles Governing the Activities of States in the Exploration and Peaceful Uses of Outer Space, including the Moon and Other Celestial Bodies. 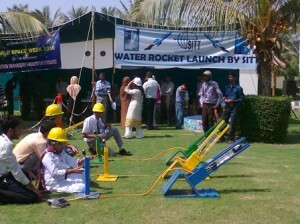 An official told the agency that Suparco, as a national space agency has been regularly conducting WSW activities each year to increase awareness of space technology and to promote its peaceful usage amongst students and the masses in Pakistan since 2005. This year, the Suparco has extended WSW activities throughout Pakistan with the partnership of key educational institutions, he said. The World Space Week WSW is celebrated in almost 89 countries around the world with the objective to educate people about the benefits that they receive from space, excite young people about science and gather public support for space programs.